VoIP Services: Why VoIP Services Are Definitely Worthy To Opt for? 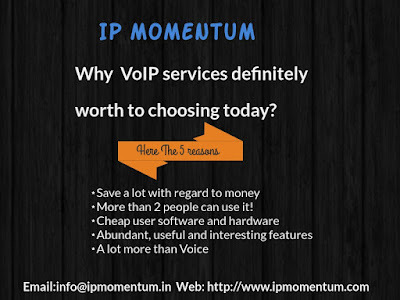 Why VoIP Services Are Definitely Worthy To Opt for? VoIP was developed for a purpose- to provide everyone with access to get in touch with each other irrespective of the location. When it comes to long distance calling or, calling on a local level too, it's quite expensive. It's sad how we think about the cost of calling a person staying in the USA, for instance, and forget about just calling and asking how they are. That's what VoIP services are for- affordable, lovely conversations. The advantages of VoIP are such that you cannot do anything but purchase it! Let's explore how it benefits each field- be it personal or professional! For the ones who still haven't signed up for VoIP service providers, PSTN is your old phone line. Did you know, you have to pay for each minute you talk over the phone using PSTN services? Guess what, international calls via PSTN are filthy expensive! VoIP uses the internet as it's backbone- all you need to pay for each month is the monthly internet bill. However, you need a decent speed internet connection. Post that, speak as much as you wish to- the cost shall be the same. Ll thanks to unlimited VoIP calling plans! Most importantly, studies have shown that VoIP can potentially save you up to 40% on local and 90% on the international calls. Also read: Why NOT Reward The Conventional Telephone System? 2. More than 2 people can use it! As we know, not more than 2 people can communicate with one another using PSTN services! VoIP's beauty is this- a whole team can also communicate with one another at the same time using it's smart feature, conferencing in real time! VoIP services and solutions have the capacity to handle more data over a carrier. Here's the thing- if you're an avid internet user and have a laptop or computer and so on, all you need are speakers, a microphone, and a sound card. These are pretty cheap and a great investment to make! There are several downloadable software packages out there online which you can use and install for the requirement. VoIP's smart features are exceptional- not only will it provide you with more space on your desk, it'll also cut down on several additional costs like video conferencing shall cut down on air fares, the fax over VoIP feature shall let go of your fax machine, click to call, music on hold, and so on. Enjoy better, sophisticated, rich yet affordable equipped call management with the introduction of VoIP in India. VoIP is just not about calling one or a group of individuals. One can also make use of VoIP services to a level where they can transfer images, videos and text along with voice! For example, send a video with inputs regarding it and use your webcam to video call too- all at the same time! There are several other ways behind why VoIP is the ultimate service provider! However, these are the prime reasons behind why VoIP belongs to the next level. 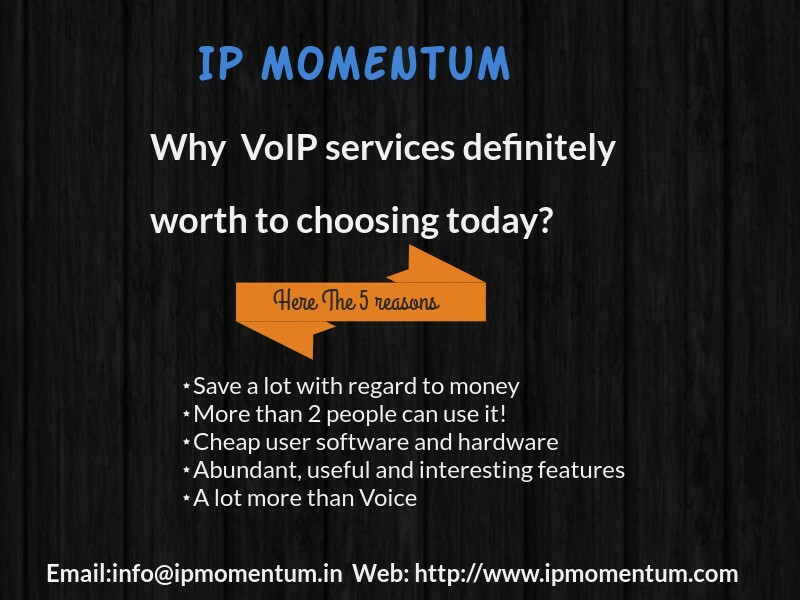 VoIP service providers like IP Momentum are not just reliable, they're way more affordable than the rest and provide with exceptional services along with 98% network availability and so on. In today's time of everything happening very quickly and efficiently, installation of VoIP services by VOIP service providers is very essential. Get yourself a VoIP phone before time runs out!